The last PPC campaign I analysed from the ‘Analyse A Real PPC Campaign’ series was from Microsoft for their software Excel. What we found was that Microsoft bid for their own brand name as, although the competition was looking to sell Excel, Microsoft’s profit margin would increase by getting web users to buy from them direct. The problem stemmed with the landing page, which was bland and did not utilize the space well. An area online that is going to continually pick up momentum is with digital downloads, such as music. Looking at this area, here is an analysis of a PPC campaign from Audio Jungle. 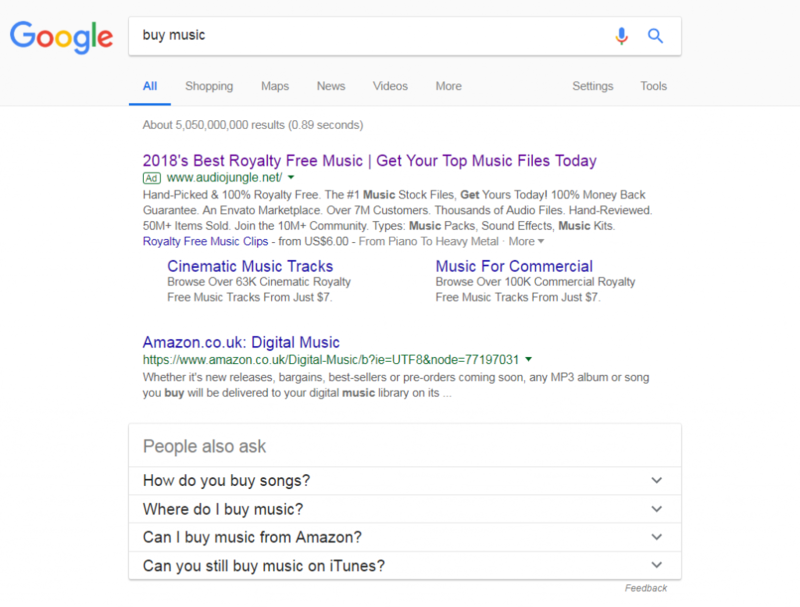 Audio Jungle is the only paid search result for this, most likely because either it is just too vague a keyword to target, or competition found it did not produce the best of results. In terms of Audio Jungle, it makes sense to bid for this keyword. They do not appear organically for quite a few pages, whilst the ‘Royalty Free Music’ is something that should attract many web users to clicking on their advert. However, as much as it is sometimes good to have a large space for an advert, using site link extensions, other ad extensions etc. it doesn’t entirely work for this advert. This is mainly because the description is so packed full with content already – it is something that would put web users off clicking, since the amount of content in this advert for a search results page is just a bit too much. These comments can be eradicated by making sure the currency matches the country you are targeting – a simple tip to remember that can really make or break a campaign.